It was not at all easy for me to find the path of this extraordinary site which seems to be forgotten by all. 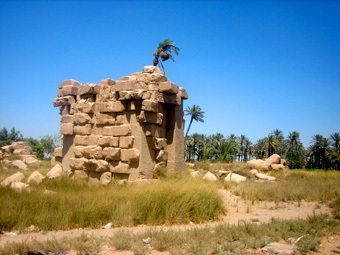 This is not the agglomeration of Biahmu, 7 km north of the capital of the vast oasis of Fayum "Medinet el Fayum" the ancient Arsinoe Crocodilopolis, but the site for the famous pedestal itself. Indeed it is not near a road today; you should walk through the thick vegetation and smiling through shaded areas and span many irrigation ditches to get there. 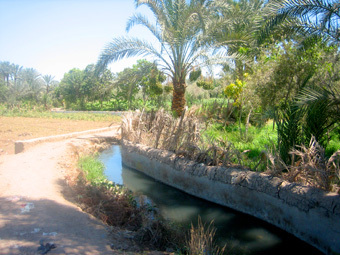 But this site is of paramount importance in my research in hydraulics and irrigation of the entire gradient of Fayum; also in my lectures abroad I continued to stress the importance of the extraordinary skills of the Pharaohs of the Twelfth Dynasty (1991-1783 Before Christ) in the development of hydrology across the colossal Egyptian territory. I also think that these were part of a major restoration work of a network probably much older still. 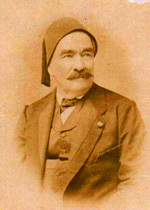 I suspect so as long as theories concerning the Fayum Depression of Linant Bellefonds (1799-1883) the famous French chef, engineer of the Suez Canal and Public Works Minister Mohamed Aly reigning over Egypt at the time, were well founded. 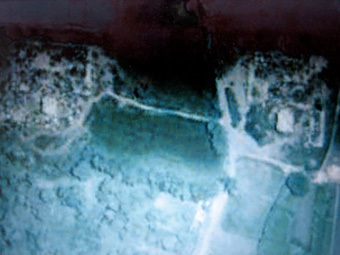 East pedestal, pyramidal shape Aerial view of the two structures of Biahmu. Linant indeed, although much discussed by others, advocated that there were two lakes Fayum: the one we see today, which was much wider in the past, and another south of Biahmu above Hawara would have been artificial (Lake Moeris), proving once again the existence of gigantic works of the Pharaohs for the welfare of the people and useful for fishing by channeling irrigation overflow and the the seasonal flooding of the Nile. But research conducted in 1988 on the dam and between Itsa Shidmuh by the Braunschweg Leichtweiss Research Institute for Water Technology proved, although not a well known fact, that this artificial lake had existed at least three centuries before Christ. This should silence the controversy about the existence or not of a second lake, this artificial Fayum. 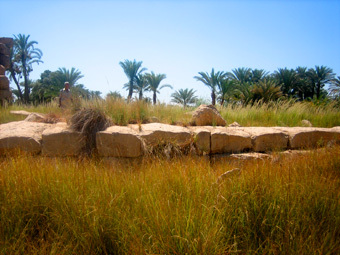 Then it became vital for me to go to the site because Biahmu's existing structures should be of great importance if they were once the center of the northern border of the second lake. And I was not disappointed because after having been there several hours, I hesitate not to say that this is indeed the "two pyramids surrounded by water topped by colossal seated statues" seen from afar by Herodotus' boat during a flood and was described by him as in the open lake. 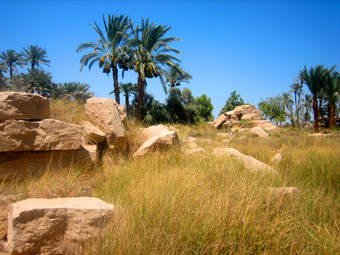 Initially, all that is known is that there are two structures of blocks of stones, pedestals to the appearance of the ruined pyramids of the region called "Kors Faraun" ie: "The chair of the Pharaoh" and also "El Aaly": "the high places, high" that were in fact the bases of two colossal statues of Amenemhat III (1807-1798 BC) who was a great builder and restorer during his long reign. From 1672 the Dominican Father Johann Michael Vansleb of Erfurt, serving our Colbert had seen the bottom of one of the statues and Lepsius and Petrie had found several fragments. Petrie estimated their height of origin: 12m to 18m but it would include pedestals. All saw that their bases in the past were washed by the waters of the lake. Drawing of Lepsius you can see a little more the pyramid shape of the pedestals. The statues on their pedestals in the shape of pyramids appeared above the waters superbly when the lake was not drained as now, and even when almost any slope, or Fayum was inundated by floodwater. This magnificent view out on the water is so consistent with the description of Herodotus describing two pyramids submerged by the waters each bearing a statue sitting on a throne at the top. 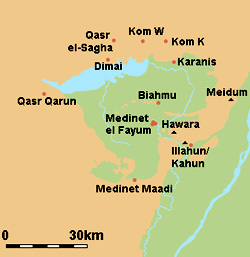 As already explained by Flinders Petrie, but nobody listened, Herodotus believed that the reason the two pyramids were half submerged was probably due to the fact of the gradient Fayum; during the flood he would have seen the two statues on pyramid bases from afar, that is from Medinet el Fayum Arsinoe today, and not from the site Biahmu, which seems quite reasonable. Walking in the countryside and crossing many small channels, I suddenly saw 1km from me the first structure; it was strange and impressive, the ground littered with high grass and large boulders. 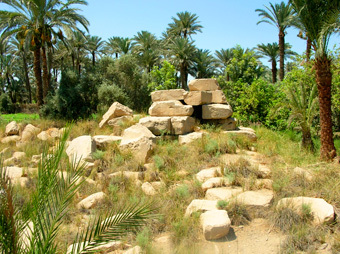 Petrie said that the two structures were looking in the same direction, towards Lake Fayum, and are 66m to one another. I noted also that the old road leading to Lake Fayum Arsinoe passes between them. The two giants are well positioned to look at any approach from the lake to the province. Flinders Petrie noted that each pedestal was a completed smooth stone facade and that made him think that these pedestals were not larger, but by dint of returning to Biahmu and looking carefully, I saw that it was not the case for all the stones; many had been displaced and given a little haphazardly, along with finished stone blocks lying around on the ground. 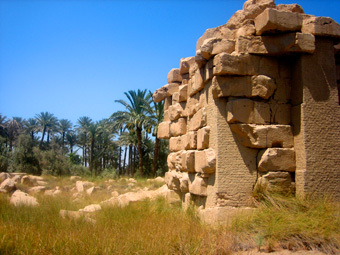 There is no doubt that treasure hunters had searched every corner of its pedestals and many people, especially during the Turkish invasion which had undertaken major work at Fayum, had blocks used for other buildings. Also after much research I found an old picture showing that the pedestals were long before, a pyramidal shape and they were much wider. If you want an idea of what this might look like, there are all the drawings included in the Encyclopaedia of Architecture in Ancient Egypt by Dieter Arnold, however, what I saw from the ground is the pedestals were higher, and should have been spoken of as much larger. Flinders says that the surfaces of the large walls surrounding each pedestal were glued to the back of the bases of statues, leaving no space and no signs of foundation to the south. I am not certain in any case for the west statue. It seems to me to find locations on the ground of several small structures in place as former storage space. Flinders Petrie found a round wall in one of the top courses and thought it was copied from the 5th dynasty, which built along its banks and courses mastaba, which makes me think that these two structures may have been there before Amenemhat III; remember that he was a great restorer of the hydraulics, channel diversions, dams and so the whole area of Fayum. Petrie found 47 fragments of the statues (the nose of the statue to the west is displayed at Ashmolean Museum, Oxford), quartz sandstone monoliths polished to shine like glass, proving he was indeed sitting on statues' thrones. He also found fragments of decorations on the facades of the thrones of the figures representing the Nile, flowers and plants, a piece of a falcon and a false door of the name of Ka and figures representing the 42 prefectures, bearing offerings. 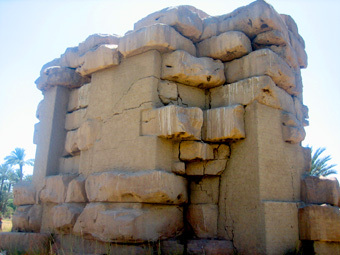 There is also, northeast of the court, fragments of red granite, indicating the former presence of a door. These include fragments of the reliefs in panels ("palace reliefs") corresponding to a decoration of the Old Empire and an inscription of Amenemhat III. What is very important to me is that this inscription refers to "his work of restoration" so it's quite possible that we have two beautifully restored structures built by Amenemhat III, but much earlier. The soil contains magnificent slabs of limestone pavements clear over darker; you can still see the stairs down to and before the pedestals, especially in front of the West. As I thought of the general Linant, who found that a dyke was perpendicular to Biahmu, and just what makes the two giants may be based on, I looked at the lake in front of them, and I bowed to his genius as I saw the North alignment of large blocks seemed to correspond well to the docks. Being welcomed by its once brilliant huge statues, coming by boat from Lake Fayum would be extraordinary. If there is a site to excavate, this is one because it certainly reserves discoveries.